Shine On You Crazy Diamonds is not only my favourite Pink Floyd track, it’s also the perfect length for downing an illicit afternoon pint. I discovered that when working in an Oxford office, the pub was a short back door exit away and that jukebox track was the length of the afternoon tea break. Fast forward about 20 years and I had the pleasure of attending Rock Story at Exit Palace in San Eugenio, Abba, Pink Floyd and Queen tributes in one show. It was my first time at this Tenerife venue and I was impressed from the courtyard complete with fountain and bar, to the large circular hall fanning out from the stage. I’m at that age now where I don’t have to worry about trying to appear trendy, so I can admit that I quite liked Abba and had a few of their records. Of course I was quite partial to the girls, Agnetha and Anni-Frid and the two ladies filling those roles were very attractive and good singers. Some of their constantly changing costumes were nicer than others but I was taken with the silver dresses with knee length glittering boots to match. There were 4 backing musicians instead of the bearded twosome and they did a fine job as all the hits paraded by. After just over 40 minutes Abba went to meet their Waterloo and I went to meet the inside bar during the first break. I had feared extortionate captive audience prices butÂ 3 euros for a pint of Reina wasn’t much dearer than the nearby bars in this part of Las Americas. Refreshed I took a pint back to my table just as the haunting opening of Is There Anybody Out There struck up, the stage burst into light and video screens and lasers came into play. A dancer/ acrobat at centre stage attached himself to a dangling hook and net and ascended slowly to girate in the cascade of light as the music played out. 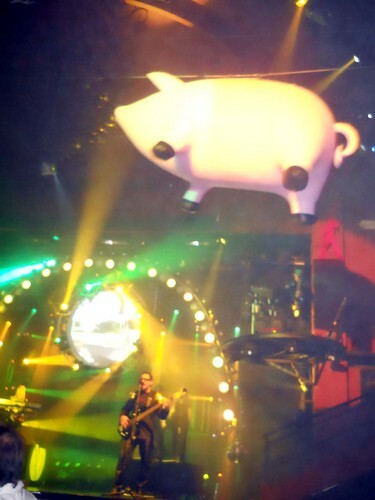 The band gave pleasing renditions of Money, Shine On You Crazy Diamonds and Wish You Were Here as the visuals held my attention, at one point an inflatable pig passed overhead, this one not destined to escape above Battersea as the original bands promotional stunt had. This tribute was part of a full show that ran elsewhere called The Pink Wall and they even managed to do a stunning re-enactment of Gerald Scarfes animated sexually charged plants thrusting and entwining to Empty Spaces. This involved two suspended acrobats in body stockings weaving their seemingly naked bodies far above the stage as the band gave the song its full passion. Another highpoint was a soaring performance by a female singer ofÂ The Great Gig In The Sky. By the time The Wall was torn down and the next break arrived, I was ready for another pint. Returning to my place this time, who should come roaring down the aisle on a motorbike, Freddie Mercury, ready to launch into Queens back catalogue with the help of the rest of the surrogate monarchs. 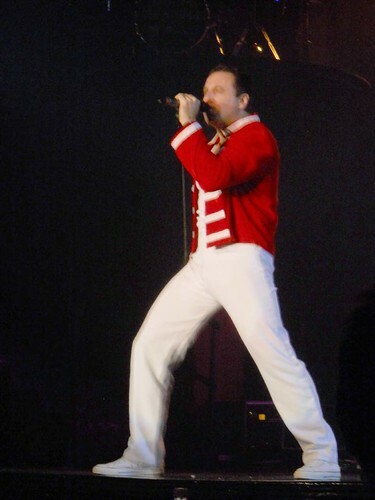 Suitably loud, proud and pruning like a peacock, Freddie led the way through Radio Ga Ga, It’s A Kinda Magic, Bohemian Rhapsody and many more. There was even time for a duet of Barcelona with a top notch diva scaling the high notes in place of Monserrat Caballe. It was all good stuff and lapped up by a decent sized audience, Abba and Queen delivered the goods but it was my Pink Floyd Greatest Hits CD that I reached for the next morning. Funnily enough my headache was shining on like a crazy diamond too.